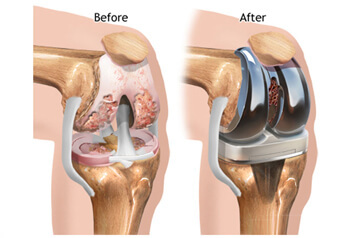 Joint Replacement Surgery is one of the most successful surgeries in the field of orthopaedics where the major joints such as hip and knee joints are replaced by artificial metal implants. Who would be offered Joint Replacement Surgery? This course of treatment is offered to people whose natural joints have been worn out by disease or trauma and face difficulty in doing their daily life activities such as walking, climbing of stairs, sitting etc. This treatment helps in restoring the functions of joint. What would be the life of a replaced Joint? Healthy organic cartilage surface is the best surface where there is minimal friction, however in the event of replacement with an implant, the friction is higher and there is likely hood of wear and tear, thus limiting the life of the implant. The life of such implants is anywhere between 15-20 years. A lot of research is ongoing to increase the life of an implant. History of Joint Replacements dates back to 1960’s and 1970’s, when different material were tried to replace the worn-out bearing surfaces including Teflon® and metallic alloys such as stainless steel and cobalt-chromium alloy. But through the 1980’s and much of the 1990’s, the preferred bearing combination was ultra high molecular weight polyethylene and cobalt-chromium. Polyethylene results in a low amount of friction when bearing against a highly polished metallic surface. Today, metal-on-metal and ceramic-on-ceramic combinations are being considered as alternative bearing surfaces. All the material used in Joint Replacement Surgeries are biocompatible and are considered medically safe. Ideal age for Joint Replacement Surgery? Joint Replacement a few decades ago was a choice of treatment for the geriatric group. But, now, with the advancement of science and technology and the need for active life has brought down the age of patient to their Early 20’s itself. The selection of material of joints for each patient is done by customizing to the needs of the patient based on the age, activity level and extent of patient’s joint pain/ problems. Hyderabad MultiSpeciality Hospital is headed by Dr. Marthala Pradeep Reddy having performed more than 8000 Joint Replacements including hips and knees, Dr. Reddy profoundly quotes that “A Joint Replacement Surgery is neither an Emergency nor a Compulsion”. A person can always postpone by simple changes in one’s lifestyle, food and exercise or have a choice of joint replacement surgery. He has been awarded the best Revision Joint Replacement Surgeon for his expertise in the field of knee & hip replacements. He is one of the leading experts and renowned specialists in revision Surgeries and has successfully completed many such re-explorations. Dr. Reddy has spent considerable time of his career in learning the best practices, from the best of the best Orthopedic Centers across the globe, opening doors for a wide scope of exposure and learning the latest procedures. “A Smile on your face, a touch with empathy and a friendly approach towards the patient make a huge difference” is what he strongly believes in. Dr. Reddy, has performed many Joint replacements on patients from USA, Middle East and South Africa. Interestingly many Orthopedic surgeons have got their family members operated by Dr. Reddy where his skill sets are clearly evident. When any bone/joint ailments requires treatment one can comfortably and completely rely on Dr. M. Pradeep Reddy, who is a perfect amalgamation of knowledge, experience and skill. Hyderabad Multispeciality Hospital is equipped with state of the art operating theatre and ICU to care for such Joint Replacement patients. The department of Physiotherapy of the hospital has a team of skilled professionals who guide and train such patients to get back to normalcy at the earliest. There are ample conditions that can result in joint pains and disability, which leads to considering joint replacement surgery. In most of the causes, joint pain is caused due to the damage of the cartilage that lines the ends of bones (articular cartilage)—either from a fracture, arthritis or another condition. If nonsurgical treatments such as medications, physical therapy, & changes to daily activities do not relieve the pain & disability, then your doctor may recommend for joint replacement surgery. 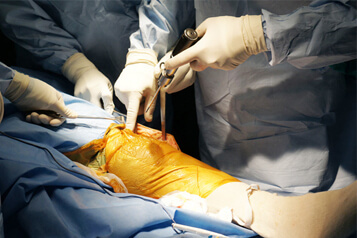 With the joint replacement surgery damaged or diseased parts of the joint are removed and replaced with new implants. The aim of joint replacement surgery is to relieve pain, and aid the joint to work better, and enhance walking & other daily activities. If a Joint Replacement Surgery is done to a Right patient by a Right doctor at a Right place – then the success rate can be more than 99%. However complications do occur if any infection develops. An exercise can also reduce the joint pains& stiffness. Wearing of joint surface can become an issue after 15 to 20 years, but with ceramics the life of an implant can last more than 30 years. Return to daily activities & function well as usual. Patients who participated in sports prior to surgery can participate in low-impact sports after surgery. Individuals can lead a normal life with few basic precautions.